Kos or Cos (English: /kɒs/ or /kɔːs/) (Greek: Κως, Greek pronunciation: [kos]) is a Greek island, part of the Dodecanese island chain in the southeastern Aegean Sea, off the Anatolian coast of Turkey. Kos is the third largest island of the Dodecanese by area, after Rhodes and Karpathos; it has a population of 33,388 (2011 census), making it the second most populous of the Dodecanese, after Rhodes. The island measures 40 by 8 kilometres (25 by 5 miles), and is 4 km (2 miles) from the coast of the ancient region of Caria in Turkey. Administratively, Kos constitutes a municipality within the Kos regional unit, which is part of the South Aegean region. 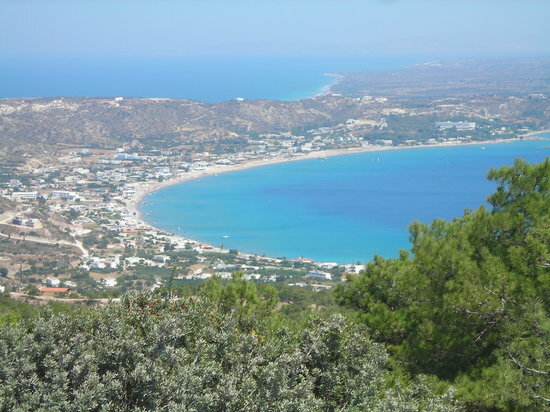 The principal town of the island and seat of the municipality is Kos town.